Kerem Raises Mega Bucks for Cancer Research! The night started off with Sarah M., Ezra B., and Shira C. as the hosts for the show. The night was filled with humorous and entertaining lip syncing performances from each bunk. Between the different skits, Kerem presented funny videos, side acts, and a boy’s dance to “Fergilicious.” Throughout the night, 5 hilarious videos made by Kerem were shown. The videos included, “Stalking Chanes,” “Emotional Breakdowns,” “Yavneh Thug Life,” “#savethesiddurim,” and “Camp Questionnaire.” The chanichim (campers) enjoyed the videos thoroughly. Before the judges announced the winners, the Kerem madrichim (counselors) performed their Kerem dance to “Rather Be” for the whole camp. All of Kerem were extremely excited, so we sung and danced along. When the dance ended, all of Kerem ran on stage and moshpitted “Kerem ’15!” After the winners were announced, Kerem celebrated all their hard work with a barbeque on the tennis courts. Thursday was achla yom (trip day) for the whole camp. Kerem spent the morning planning activities and events for the machaneh (camp). After lunch, we jumped into the agam (lake) to cool off and relax. 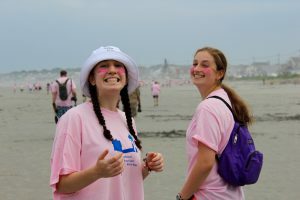 After we finished swimming, we hopped on our buses and headed to the York Beach Breast Cancer Walk. Throughout the summer, Kerem has been reaching out to family members, relatives, and close friends to ask for donations for the Cancer Walk. In total, Kerem raised an incredible $6,354 for York Hospital. When Kerem arrived to York Beach we received the breast cancer walk t-shirts. Before the walk, there was a ceremony for breast cancer survivors. All the survivors held hands and walked in a circle as the crowd sang “We March Together.” After this, Kerem presented their dance to “Twist and Shout” for everyone, while other people from the walk joined us. After the dance, ended we started the walk. We found walking with breast cancer survivors and supporters to be really special. As we walked along York Beach, we overlooked the beautiful ocean. Even though it started to rain and thunder, the walk was a lot of fun. We danced and sang in the rain until we finished the walk. 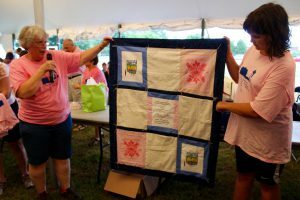 Afterwards, the lea ders of the walk celebrated Camp Yavneh’s 10 years of participation in the walk by presenting us with a hand-quilted blanket made from past cancer walk t-shirts. We were very thankful and happy to be a part of such an amazing organization. When we got back to camp, we hung the blanket on our wall in the Kerem lounge. And now, as we are approaching our second Shabbos of second session, we are excited to bring our incredible ruach (spirit)! Until next time!